NEW! Ladies, at last there is a Warrior's Rosary designed just for you! 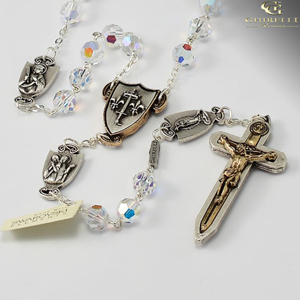 Created by the author of the book, "Called to Knighthood", Thomas K Sullivan, and manufactured by premier Italian rosary maker Ghirelli -- creators of our Holy Father's Official Papal Gift Rosaries, this rosary is hand-made and the only one-of-its-kind design based upon the original Warrior's Rosary. The Warrior's Rosary brings together the elements of "Military Combat" and "Spiritual Warfare" and places one of the most powerful weapons in spiritual warfare into your hands. Available in six different bead colors and combinations. Each piece is custom designed to embody the reality of a Spiritual Warrior in the Kingdom of God that every baptized Christian is called to be. Beginning with the Crucifix, made from Zamak material (a strong set of zinc and aluminum alloy in a silver and gold antique finishing), this Crucifix takes the three scriptural images of the Word made flesh in the person of Jesus Christ, the Sword of the Spirit which is the Word of God, and the victory of the Cross, and combines them into a truly one-of-a-kind Crucifix. The back of the Crucifix features the sword affixed to the cross with the word "KNIGHT" on the blade below the handle. The Centerpiece is also made from Zamak alloy in silver and gold antique finishing. The front features a design of the "Coat of Arms" from Joan of Arc. On the back, a beautiful image of Mary holding the baby Jesus raining down rays of Grace upon a woman knighting a knight on his knees, representing Holy Mother Church administering the Sacraments of Baptism (Enlistment into the service of the King) and Confirmation (Strengthening for Spiritual battle). The Our Father Medals are also constructed from Zamak alloy in a silver antique finishing. No Knight, Warrior or Soldier goes into battle alone. The Catechism of the Catholic Church makes it clear that prayer is "a battle". Therefore, this Warrior's Rosary for Women features a female saint from different parts of the world and periods of time on each of its medals which forms an elite spiritual "Special Forces Team" that goes into battle with you every time you pray the rosary. The first Our Father medal features an image of Our Lady of Guadalupe, crushing the head of the Serpent. The second Our Father medal features an image of Sts. Perpetua and Felicity, martyred for refusing to deny their faith and worship Roman false gods. The third Our Father Medal features an image of St. Quiteria, martyred for refusing to worship Roman gods and breaking Christians out of Roman prisons with her eight sisters. The fourth Our Father Medal an image of St Thérèse of Lisieux or Saint Thérèse of the Child Jesus and the Holy Face, O.C.D., she was a French Discalced Carmelite nun. She is popularly known as "The Little Flower of Jesus" or simply, "The Little Flower". A great example of holiness in the face of much suffering. The fifth Our Father Medal features an image of St. Joan of Arc, the patroness of soldiers and of France. She is nicknamed "The Maid of Orléans" (French: La Pucelle d'Orléans) and is considered a heroine of France. The sixth Our Father Medal features an image of Blessed Mary Restituta Kafka, a Franciscan nun and surgical nurse. She was martyred under Hitler for refusing to remove crucifixes from her hospital, her last words were, "I have lived for Christ; I want to die for Christ" The Chain is hand made in Italy using brass wire & strong linking chain in a silver finish. This is an amazing rosary for every man, woman and child to own. It comes in its own custom designed "The Warrior's Rosary for Women" box and will make an excellent gift and family heirloom for all. This Warrior's Rosary for Women is available in the following sizes and colors: 1. Item# WG13/7 - 7mm Swarovski crystal beads. Crucifix and centerpiece are a two tone antique gold and silver finish with all the Our Father medals antique silver. 2. Item# WG02/8 - 8mm Pink Bohemian glass beads with antique pearl finish and 8mm Swarovski Crystal elements. Crucifix and centerpiece are a two tone antique gold and silver finish with all the Our Father medals antique silver 3. Item# WG08/7 7mm Amethyst Bohemian Glass Faceted beads with Aurora Borealis effect Crucifix and centerpiece are a two tone antique gold and silver finish with all the Our Father medals antique silver. 4. Item# WG09/7 - 7mm Blue Bohemian Glass Faceted beads with Aurora Borealis effect. Crucifix and centerpiece are a two tone antique gold and silver finish with all the Our Father medals antique silver. 5. Item# WG10/7 - Black Bohemian Glass Faceted beads with Aurora Borealis effect Crucifix and centerpiece are a two tone antique gold and silver finish with all the Our Father medals antique silver. 6. Item# WG15099A - 6mm Semi-Precious Stone Hematite. Crucifix and centerpiece are a two tone antique gold and silver finish with all the Our Father medals antique silver. Have a question to ask? Click here.